175 Beacon is located on the south side of Beacon, between Berkeley and Clarendon, with 173 Beacon to the east and 177 Beacon to the west. 175 Beacon was built ca. 1866 for lace and embroidery dealer Andrew Carrico Mudge and his wife, Cornelia Adelaide (Hawkes) Mudge. Andrew Mudge purchased the land for 175 Beacon on January 27, 1866, from real estate dealer Henry Whitwell. It was part of a parcel originally purchased from the Commonwealth on February 4, 1860, by Norman Munson. He and his partner, George Goss, were the contractors responsible for filling the Commonwealth’s Back Bay lands. Click here for an index to the deeds for 175 Beacon. The houses to the east at 169-171-173 Beacon were built at about the same time by builder Paul Wallis. 169-171 Beacon are built as a symmetrical pair, and it appears that 173 Beacon was built in anticipation of there being a companion building at 175 Beacon, forming another symmetrical pair. However, although subsequent remodeling of 175 Beacon has obscured its original design, it does not appear that it was originally a “sister” house to 173 Beacon. 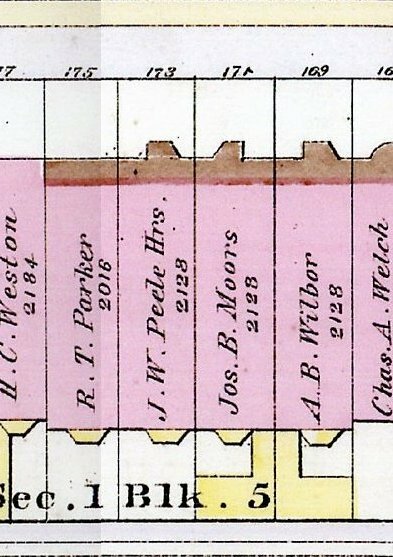 The 1883, 1888, and 1895 Bromley maps show the front façade of 175 Beacon as being brownstone, like 169-171-173 Beacon, but without a bay. 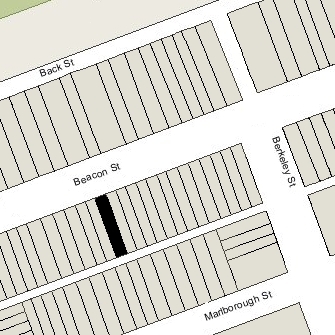 The 1898, 1902, and 1908 maps also show it as brownstone, but with a bay widow having been added, drawn as a window rather than a full bay like 169-171-173 Beacon. The 1912 and later Bromley maps include the bay window but show the front façade as being brick, indicating that it was re-faced sometime between 1908 and 1912. It appears likely that the front entrance was lowered to street level at the same time. It appears that the Mudges never lived at 175 Beacon. 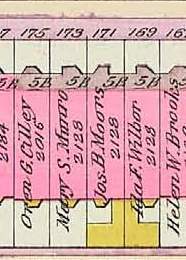 In 1868, they were boarders at 39 Somerset, and in 1869 they lived in Brookline. By 1870, they were living at 122 Marlborough. On May 17, 1869, 175 Beacon was purchased from Andrew Mudge by Penfield Bull Goodsell. He and his wife, Julia (Perley) Goodsell, made it their home. They previously had lived at 614 Tremont. Penfield Goodsell was a physician by training, but in the late 1860s and 1870s was a wholesale dealer in kid gloves and coral goods. In the late 1860s, he also was publisher of The Saturday Evening Gazette. By 1880, he had become a physician once again. Julia Goodsell died in July of 1870. Penfield Goodsell continued to live at 175 Beacon and, it appears, accepted lodgers. His adopted son, Evelyn Louis Bonn (who took the name Evelyn Bonn Goodsell), lived with him. In 1872, attorney Elias Gilbert Merwin and his wife, Anne Mary (Childs) Merwin lived with Penfield Goodsell at 175 Beacon. They previously had lived at 23 Beacon. By 1873, the Merwins had moved to a newly-built home at 126 Commonwealth. By 1875, Penfield Goodsell’s mother, Eliza (Bull) Goodsell was living with him and Evelyn Bonn Goodsell. Penfield Goodsell continued to live at 175 Beacon until about 1877, when he (and probably his son) moved to 306 Columbus. His mother moved to Hartford, Connecticut, at about the same time (she died there in December of 1882). On June 26. 1877, the Boston Five Cents Savings Bank foreclosed on its mortgage to Penfield Goodsell and sold 175 Beacon to James W. Dunphy, an employee of Roland Worthington & Co., publishers of the Daily Evening Traveller newspaper. On the same day, he transferred it to Roland Worthington’s wife, Abbie (Abby) Bartlett (Adams) Worthington. Roland and Abbie Worthington lived at 9 Hawthorn in Roxbury. On May 23, 1878, the Boston Five Cents Savings Bank foreclosed on its mortgage to Abbie Worthington and sold 175 Beacon of real estate dealer John Jeffries, Jr. On the same day, 175 Beacon was acquired from him by banker Richard Tucker Parker. Richard Parker was a widower, his wife, Martha (Thorndike) Parker, having died two months earlier, in March of 1878. They had lived at 85 Beacon. He also maintained a home in Beverly Farms. He continued to live at 175 Beacon during the 1891-1892 winter season, but moved thereafter to Dublin, New Hampshire. On May 10, 1892, 175 Beacon was acquired from Richard Parker by Dr. Orran (Oren) George Cilley, a physician, He and his wife, Mary Jane (Haines) Cilley, made it their home. They previously had lived at 35 Cambridge, where he continued to maintain his medical office. They also maintained a home in Hamilton. Based on the Bromley maps, it appears that the bay window at 175 Beacon was added in the mid-1890s, while it was the Cilleys’ home. 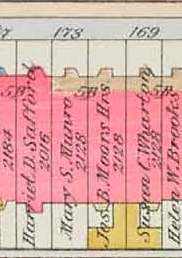 In June of 1900. at the time of the 1900 US Census, the Cilleys were living in Hamilton, and 175 Beacon was temporarily the home of Ernest Douglas and his wife, Grace (Parsons) Douglas. They had married in October of 1899. He was an organist, composer of liturgical music, and music teacher, and by 1906 was organist and choirmaster at St. Paul’s Episcopal Church in Los Angeles. The Douglases had moved by the 1900-1901 winter season, and 175 Beacon was once again Orran and Mary Cilley’s home. They continued to live there until about 1907, after which they made Hamilton their home. On May 1, 1907, 175 Beacon was purchased from Orran Cilley by Harriet (Denison) Safford, the wife of William C. Safford. They previously had lived at 10 Keswick. 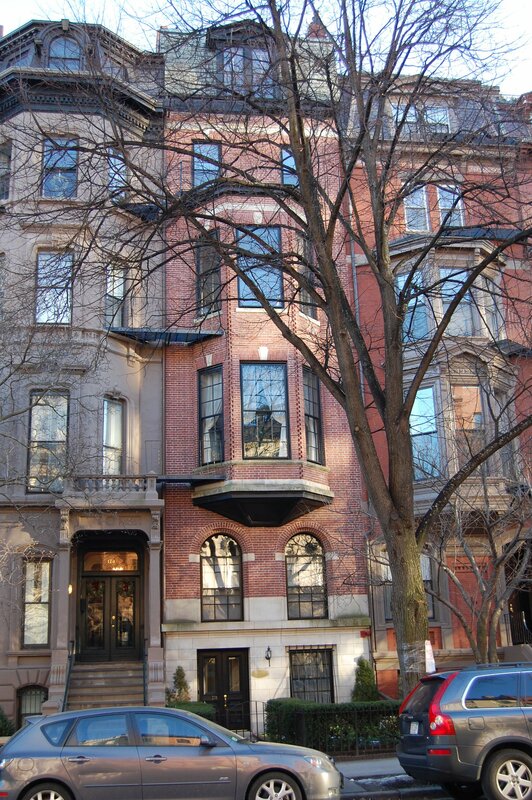 William Safford was an interior decorator (with a studio at 73 Newbury), upholsterer, and furniture manufacturer. Based on the Bromley maps, it appears that it was while 175 Beacon was owned by the Saffords that the front façade of 175 Beacon was rebuilt, including replacing the brownstone façade with brick and lowering the ftont entrance to street level. The Saffords continued to live at 175 Beacon until about 1912, when they moved to West Newton. Harriet Safford continued to own 175 Beacon and lease it to others. The house was not listed in the 1913-1915 Blue Books. During the 1915-1916 winter season, 175 Beacon was the home of Harriet Pierce (Weeks) Anthony, the widow of banker Silas Reed Anthony, and their unmarried children, Ruth Anthony and Reed Pierce Anthony. They previously had lived at 125 Beacon. Ruth Anthony married in February of 1916 to attorney Lyon Weyburn. After their marriage, they lived at 175 Beacon with her mother and brother. Harriet (Weeks) Anthony re-married in June of 1916 to attorney Randolph Frothingham. They lived at 175 Beacon after their marriage. Lyon Weyburn and Randolph Frothingham had been in the same class at Harvard Law School and lived together at 137 Petersborough prior to their marriages. 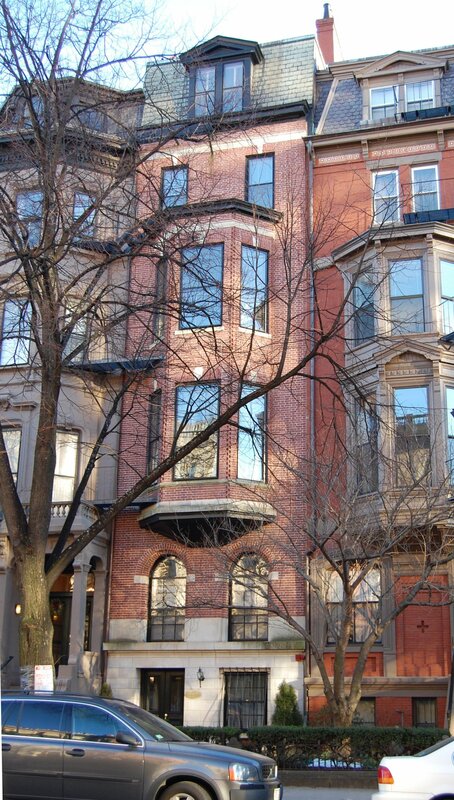 By 1917, the Frothinghams, the Weyburns, and Reed Anthony had moved to 113 Commonwealth, which had been Harriet Frothingham’s home before her first husband’s death and was still owned by her. By the 1916-1917 winter season, 175 Beacon was the home of Courtlandt Richardson and his wife, Mimi (Carr) Richardson. He was a stove and furnace manufacturer. They previously had lived in Brookline. They continued to live at 175 Beacon during the 1918-1919 season, but had moved to New York City by 1920. On July 7, 1919, Harriet Safford transferred 175 Beacon into her husband’s and her names. During the 1919-1920 winter season, 175 Beacon was the home of Franklin Warren Hobbs and his wife, Jane Hallett (Whitman) Hobbs. Franklin Hobbs was president of Arlington Mills. By the next season, they had moved to 128 Beacon. 175 Beacon was not listed in the 1921 and 1922 Blue Books. During the 1922-1923 winter season, it was the home of department store heir Harold Leufroi Chalifoux and his wife, Elizabeth Alice (Burrage) Chalifoux. They previously had lived at 63 Commonwealth. They also maintained a home in Beverly. By the 1923-1924 season, they had moved to 367 Beacon. On August 5, 1923, 175 Beacon was purchased from William and Harriet Safford by Honora Elizabeth Temple (Winthrop) Minot, the wife of Joseph Grafton Minot. They previously had lived at 301 Berkeley. Joseph Minot was treasurer of the Tudor Company, a shipping merchant specializing in the worldwide shipping of ice. He had succeeded his father, Charles Henry Minot, in that position. Honora Minot’s niece, Honora Mason, lived with them until her marriage in May of 1927 to John Lloyd Winston (Honora Mason’s parents, Philip Dana Mason and Mary Emma (Winthrop) Mason, had both died when she was an infant). The Minots continued to live at 175 Beacon in during the 1927-1928 winter season, but moved thereafter to an apartment at 100 Beacon. They also maintained a home in Santa Barbara. 175 Beacon was not listed in the 1929 Blue Book. On March 20, 1929, it was purchased from Honora Minot by Sarah (Lawrence) Slattery, the wife of Rt. Rev. Charles Lewis Slattery. They previously had lived at 290 Marlborough. Rt. Rev. Slattery was Episcopal Bishop of Massachusetts; Sarah Slattery was the daughter of Rt. Rev. William Lawrence, Charles Slattery’s predecessor. Charles Slattery died in March of 1930. Sarah Slattery continued to live at 175 Beacon. In the late 1930s, she became active in the Oxford Group and its successor, Moral Re-Armament, an organization dedicated to international cooperation. She continued to live at 175 Beacon in 1947. In June of 1948, she applied for permission to convert the house from a single-family dwelling into a music school. The application was denied and she subsequently abandoned her application. On September 8, 1948, 175 Beacon was purchased from Sarah Slattery by Cyrene James Smith and his wife, Harriett Mary (Vossahlik) Smith. They lived in Revere, where he was a supervisor of the electrical department in the City of Revere. On November 22, 1948, Cyrene and Harriett Smith transferred 175 Beacon to their daughter, Harriett Marie Smith, an attorney, and on the same day, she transferred it to her sister, Rennie (Smith) Reda, the wife of Khalil Reda. On April 13, 1948, Rennie Reda transferred the property to Patricia Salvatore of Revere. In September of 1950, Rennie Reda filed for (and subsequently received) permission to convert 175 Beacon into a lodging house. And on September 27, 1951, Patricia Salvatore transferred the property back to Harriett M. Smith. The Smith family continued to operate 175 Beacon as a lodging house under the management of Harriett Smith’s sister, Mary Beryl (Smith) Kennedy. She and her husband, Irving John Kennedy, lived at 200 Commonwealth, where they also operated a lodging house. On April 14, 1955, 175 Beacon was acquired from Harriett M. Smith by John E. Hicks. He and his wife, Anna Louise (Day) Hicks, lived in South Boston. John Hicks was an engineer and Louise Day Hicks was a real investor and operator of lodging houses. Louise Day Hicks was elected to the Boston School Committee in 1961 and was an outspoken opponent of using busing to integrate Boston’s schools. In 1967, she was an unsuccessful candidate for Mayor, but in 1969 was elected to the City Council. In 1970, she was elected to the US Congress, but was defeated for re-election in 1972. She was reelected to the City Council in 1973 and 1975, but then lost two successive bids in 1977 and 1981. On August 24, 1955, John Hicks transferred 175 Beacon to himself as trustee of the J. & W. Trust. From the mid-1950s, 175 Beacon was leased by Burdett College, which operated it as the Hammond House dormitory. In July of 1962, John Hicks applied for (and subsequently received) permission to convert the house into a dormitory, apparently legalizing its current status. On March 6, 1968, he transferred the property to his wife as trustee of the J. & W. Trust. 175 Beacon remained a dormitory for Burdett College until the early 1970s. On January 8, 1973, 175 Beacon was acquired from Louise Day Hicks by Peter Swartz, general partner in the Kenley Realty Company, to which he transferred the property on the same day. Kenley Realty Company converted 175 Beacon into twelve apartments, but appears to have continued to operate it as a dormitory for Emerson College until about 1976. The property changed hands and on February 25, 1980, was acquired by James M. Dangelo, trustee of the Edgemont Realty Trust. On July 2, 1984, he transferred the property to himself and his wife, Michelle F. Dangelo. In November of 1984, James Dangelo applied for (and subsequently received) permission to convert the property from twelve to nine apartments, and in August of 1985, he applied for (and subsequently received) permission to convert the number of apartments from nine to seven. On October 31, 1989, he transferred 175 Beacon back to himself as trustee of the Edgemont Realty Trust. 175 Beacon remained an apartment building in 2017. On August 28, 2017, 175 Beacon was purchased from James M. Dangelo by the 175 Beacon Street LLC (Brendan Feeney and Aidan Feeney, managers of record). In December of 2017, it applied for (and subsequently received) permission to remodel the building into a single family dwelling.